The two main centrist coalitions in Sweden have failed to win a majority in the general elections leading to a deadlock in the country as fears over immigration granted the far-right Sweden Democrats party lead. The usually liberal Sweden turned to the right, like other European countries seem to be doing, as fears of the effects of globalisation and immigration following armed conflict in the Middle East and North Africa grew in the country. In Sweden, an influx of 163,000 asylum seekers in 2015—the most in Europe in relation to the country’s population of 10 million—has polarised voters and fractured the long-standing political consensus. With almost all districts having reported, the ruling centre-left Social Democrats and Greens and their Left Party parliamentary allies had 40.6 per cent of the vote, while the opposition centre-right Alliance was at 40.3 per cent, the Reuters said. The Sweden Democrats, a party with roots in the white supremacist fringe, won 17.6 per cent and 63 seats, up from 12.9 per cent and 49 seats in the last election four years ago, the biggest gain by any party in Sweden’s parliament, the Riksdag. 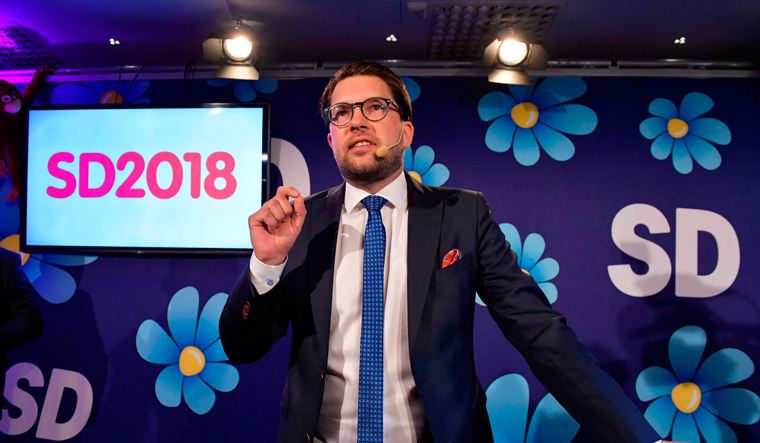 Claiming a kingmaker role for this party, Jimmie Åkesson, leader of the Sweden Democrats, said in a speech at his campaign headquarters that his party will now have "influence over Swedish politics." Sweden was once particularly welcoming to refugees, but the issue of migration has became highly politicized following a steady increase in new arrivals. In 2015, Sweden, a country of 10.1 million people, took in more than 160,000 asylum-seekers. Support for the far right in Sweden mirrors similar trends in other European nations following the mass migration of refugees to the region in 2015, at the height of the Syrian war. Anti-migrant parties in Germany, Austria, Denmark, France, Hungary, Italy and the UK have all made gains in recent years.